Gas dynamic spraying equipment DYMET is applied to spray various metal coatings on the base of aluminum, copper, zinc, nickel, lead, tin, babbit. Deposition of iron, cobalt, vanadium and some other metals is also possible. 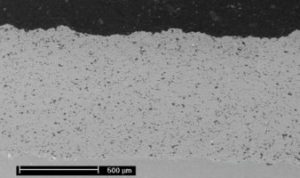 coatings may be deposited to any metal, glass and ceramic substrate. 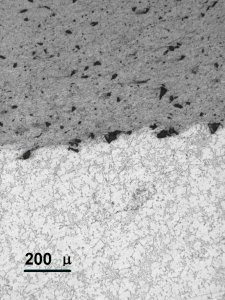 Coatings represent uniform dense layer of compacted plastically deformed metal particles with inclusions of impinged ceramic particles. 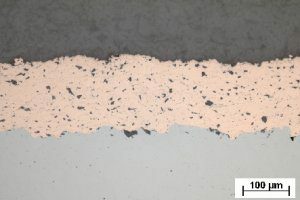 Al coating at steel interface. Low Pressure Cold Spray Technology | Powered by Mantra & WordPress.